The time in between lunch and dinner can be a real danger one for poor food choices. 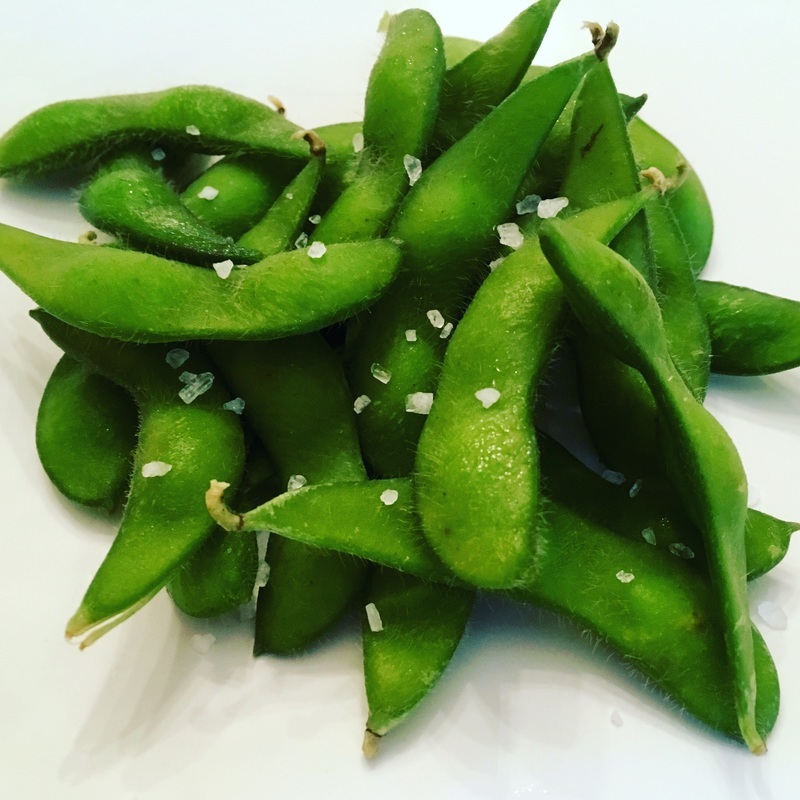 Frozen edamame in the shell is a perfect midday snack. It is convenient, fun and loaded with perfectly balanced nutrients to help you get to dinner without a trip to the vending machine or drive through. Edamame is the soy bean in its pod. In the Western world soy has become somewhat of a controversial food and part of a complicated issue. The common concern related to soy consumption is its high levels of specific isoflavenoids called phytoestrogens. These molecules are biologically active and have similar structure to the estrogen hormone. It is scientifically accepted that over exposure to estrogen can increase risk of certain cancers and some fear induce premature development in girls and unwanted development in males. Much of the confusion originates form studies done on rats which saw increased tumor development with a diet high in isoflavenoids. However, rats metabolize these phytonutrients differently than humans. Rats do serve as a very important model in laboratory research. However, not all observations can be applied to humans, such as this case. In fact, when the consumption of soy and disease rates are compared in humans, it has been found that people with the highest intake of soy have significantly lower rates of all chronic diseases, even breast cancer. As for early or unwanted breast development, the amount of soy that would have to be consumed would not be recommended under any circumstances. Another concern people have is they believe all soy is highly processed and genetically modified. There are definitely many processed soy products on the market and these products should be avoided because they are processed not because they contain soy. It is also true that most soy is genetically modified. However, this soy is used to feed livestock, make bio-diesel, and highly processed foods. Soy products such as tofu, miso, tempeh, soy milk, soy yogurt or edamame are going to be organic. There is no market for GM soy milk for example. Westerners should not be villianizing this protein source. Instead they should be looking for ways to increase their intake of soy products. This plant food provides high quality protein, micronutrients, phytonutrients, fiber (depending on the product), is low in calories and are without question an ally in disease prevention. Microwave the edamame for about 30 seconds if frozen. !5 seconds if fresh. If you prefer to steam heat about an inch of water in a medium pot with the a vegetable steamer. Place the edamame on the steamer and cover with a lid for about 3 minutes while the water is simmering.